Marco Espinoza is reinventing small-town corporate culture and manufacturing along the eastern shore of Lake Wausau. That’s where, in the quaint city of Schofield, Wisconsin, a tiny sheet metal shop emerged in 1947 and has since transformed into a global producer of ventilation products. Today, the employee-owned Greenheck Fan Corporation is championing its legal leader as a cultural change-maker. The general counsel at Greenheck since 2016, Espinoza has teamed up with human resources on a mission to evolve the company once again by energizing collaboration and innovation. Now, Greenheck is incorporating state-of-the-art technologies into its manufacturing process and promoting diversity in the workforce more than ever before. Espinoza is an advocate for these efforts, helping to draw talent from local high schools and engineering experts from around the world. 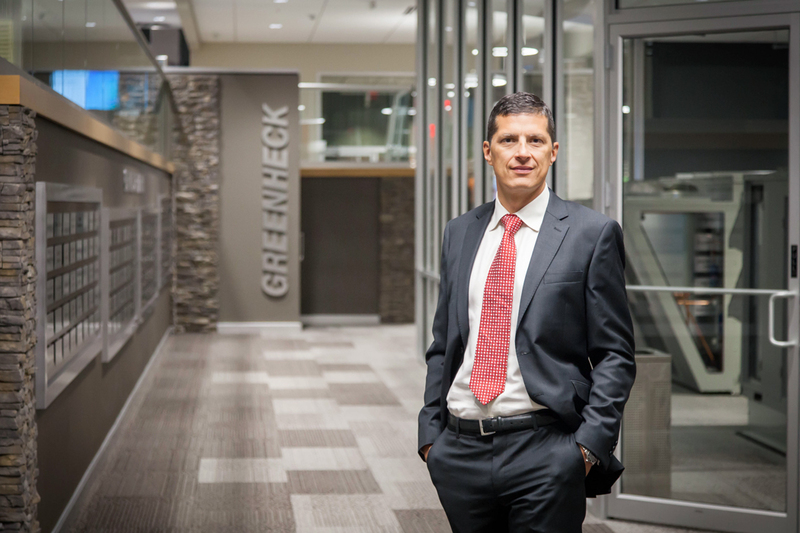 Modern Counsel caught up with Espinoza to reveal the connections Greenheck is establishing between workplace amenities, immigration, artificial intelligence, and Midwestern hospitality. How did you become aware that attracting talent was a challenge, and how did you decide that you wanted to play a role in resolving it? The worker shortage is a universal issue in the US now. Talented workers are moving toward bigger cities, especially millennials. That’s why we try to give our employees an experience where the work you do can also be part of the life you live. We have progressive employer ideas and employee-focused programs. We have an on-site clinic. We have an on-site pharmacy. We have an on-site gym. What steps have you taken to attract talented employees? There was this great opportunity that I thought was being missed, and that was hiring immigrants. We have all these super-smart engineers coming from other countries to study in the US on F-1 visas. When our HR folks were going on recruiting trips to colleges and universities, they were coming to our table, but we weren’t considering them as viable candidates because of our limited understanding of the legal process. We thought, “Oh, they can’t work.” But they can. It just took a little bit of understanding on my part—researching, getting to know some immigration attorneys, and asking them about the process. Since I learned about hiring immigrants, I’ve been able to help human resources make decisions. We’ve recruited some great candidates—and not only students. What are the advantages of focusing on immigrants in that way? Both my parents and my wife’s father immigrated to the US to be doctors when there was a shortage. We’re experiencing the same thing now in the engineering world and in tech. Economically, it’s probably less burdensome on the company to recruit them through the immigration process rather than pay a third-party recruiter to do it. Then, you get their loyalty, you get their buy-in. Then, you create the corporate culture that fosters diversity and doesn’t just ignore it or put it on the sidelines. What are the other features of Greenheck that make it a great place to work? I think it’s the energy. It’s this sort of incalculable, “hard to notice unless you’re looking for it but also very pervasive” feeling you get when you’re here. Generally, Midwestern people are going to be pretty nice and welcoming. You get the impression when you’re visiting that people like working here. A big topic in manufacturing right now is artificial intelligence. Is that part of life at Greenheck? We have robotic welding, and I would love to see us use more advanced technology in manufacturing. The production manufacturing worker of the future is, by nature, going to be a person that’s comfortable with advanced technology. That’s the kind of worker of the future that we’re out there fighting for every day. You talked about building a new campus in Tulsa, Oklahoma. What does that project entail for you? Oklahoma and Wisconsin are different. How do you engage a new culture of people into your corporate culture? We know we want to treat people well, pay people well, engage them in our company culture, and also learn from them. You know, I think of a question I got last summer that I never thought I’d get in Wisconsin. In North Carolina, where we have a plant, they wanted to have a company picnic, and they said, “Marco, are you okay with us doing mini-bull riding? Because it’s a really big thing here in North Carolina.” My first thought was, “Well, why don’t you just do a bouncy house?” But mini-bull riding is the big thing there, you know? Ultimately, I said no. I just didn’t think it was the greatest idea because the guy didn’t have insurance. But those are the kinds of interesting things you get involved in.